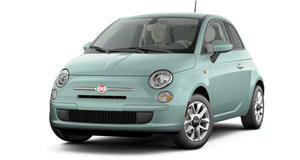 The upcoming 2012 Fiat 500 Abarth will make its official U.S. debut at the 2011 LA Auto Show. According to FiatAmerica&apos;s official Twitter account, the Italian automaker said that "The FIAT 500 Abarth will be officially unveiled at this year&apos;s LA Auto Show." We have already known that the Fiat 500 Abarth was making its journey to the U.S and that it would also be on sale in the first quarter of 2012. Something we did not know was that the Fiat 500 Abarth would make its official U.S. debut at the 2011 LA Auto Show. Under the hood, the Abarth generates its power from a turbocharged 1.4-liter T-Jet engine delivering an output of 135 horses. The small sized sport hatchback will also provide some pretty sporty handling with 2,350 pounds of curb weight to lug around town. The Abarth is ideal for squeezing into that tight parking spot. No word yet on any pricing for the Fiat 500 Abarth. Photos displayed are of the 2009 Fiat 500 Abarth.